Roof design is critical to the safety of passengers during rollover crashes. When a rollover occurs, immense pressure is put on the roof of the vehicle as it comes into contact with the ground with the full weight of the vehicle above it. Vehicles weighing less than 6,000 pounds are required to have a roof that is designed to withstand at least one and a half times the vehicle's weight in testing. However, rollover prone vehicles such as SUVs are typically not bound by this rule as they exceed the weight. 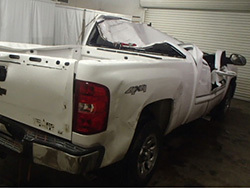 This means that many SUVs have roof designs which are unable to protect passengers in the event of a rollover. The rollover attorneys at the Willis Law Firm have the skills and experience necessary to help victims of rollover roof crush accidents seek the compensation they need. For more information about how a lawsuit might help you to address medical bills, lost wages, and pain and suffering, contact us today at 800-883-9858. Because these are problems that are known and which could be rectified through changes in design, there can be no tolerance for roof crush incidents which inflict unnecessary harm. The Willis Law Firm is committed to helping victims of roof crush incidents to hold manufacturers accountable for their failure to resolve roof design flaws. If you or someone you love was injured in a rollover accident, contact us by calling 800-883-9858 today.